This entry was posted in Nomi di Fantasy on June 29, 2018 by Dehumanizer. Anyway, this guide shows how to manually delete HSTS (which pinning is a part of) cache entries from Firefox and Chrome, which will make your browser “forget” about the key pinning and be able to access FNG again. You only have to do it once (for any browser that’s accessed the site in the past 2 months). You should delete any keys for “www.fantasynamegen.com” and “fantasynamegen.com”. This entry was posted in FNG blog on September 11, 2017 by Dehumanizer. Yes, not exactly “fantasy”, but it was fun to program, and I’m pleased with the results. Enjoy: Rock Band Names Generator. This entry was posted in New on FNG on August 29, 2017 by Dehumanizer. As promised, here comes Nomes para Bebés, the Portuguese version of Baby Names Generator. Not a lot to say: mostly the same code, but of course the names list is completely new. This entry was posted in ITIL learning tools, Nomes para Bebés and tagged brazilian names, ITIL, ITIL learning tools, nomes brasileiros, Nomes para bebés, nomes portugueses, portuguese names on February 2, 2016 by Dehumanizer. Here it is: Baby Names Generator . This is something I’ve been thinking about doing for a long time (from what I’ve seen, I did some initial work on it in May 2015! ), but haven’t had the time to finish it until now. In technical terms, it’s not very far from the other sites, though some code has been simplified. 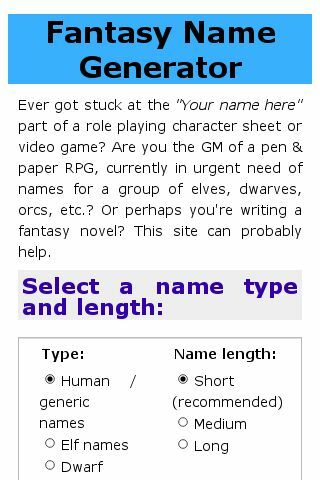 This is not just the old Fantasy Name Generator with all options other than English modern names removed, by the way — the database is completely new, names are separated by genders, and the “first name beginning with letter X” feature is new. I’m curious about the kind of public it’ll generate. 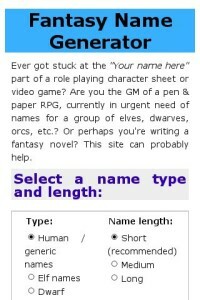 FNG is a “geeky” site, with naturally “geeky” visitors (interested in RPGs, video games, fantasy, etc. ), while BNG should appeal to a different population segment. I’m also interested in seeing whether it can compete in a relatively established field, where sites not only look (arguably) a lot better and more professional (as I’ve said often here, I’m no designer), but also seem to offer every feature but the kitchen sink (name meanings! popular names by country! by state! by year!). While I’m sure those features are interesting, I believe baby names can work the same way as fantasy names: you look at a list, and either one name jumps at you and you say “it’s perfect!”, or one name makes another one come to your mind, and that’s the one. Sometimes, all you need is a little inspiration, after all. This entry was posted in Baby Names Generator on January 22, 2016 by Dehumanizer. Anyway, because at least about 20% of Fantasy Name Generator visitors do so using some sort of mobile device, and also because Google apparently favors “mobile-friendly sites” these days in their search rankings, I’ve spent some time trying to make FNG work better on mobile devices (especially ones with small screens, such as smartphones). On a desktop, it should look the same as before. Please let me know if you notice any problems. Note: the non-English language versions haven’t been updated yet. Look for it in the next few days. 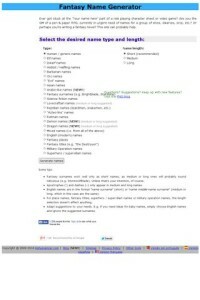 This entry was posted in New on FNG and tagged Mobile friendly on May 8, 2015 by Dehumanizer. Currently on Fantasy Name Generator (the original English / international version) and Nomes de Fantasia (the Portuguese version). Other versions (Spanish, French) to come. Also, as suggested by Katzengeist, “oriental names” were renamed “Asian names”. As always, any questions / suggestions, please let me know. This entry was posted in New on FNG and tagged Arabic names, Asian names on October 29, 2013 by Dehumanizer. Coincidentally, both work better with medium or long names, instead of the default short ones. This is suggested in the main site. So, enjoy the Demon names and Dragon names. This entry was posted in New on FNG and tagged Demon names, Dragon names on September 24, 2013 by Dehumanizer. This entry was posted in New on FNG on September 2, 2013 by Dehumanizer.